Caravan Soft Machine and the Wilde Flowers feature heavily in the latest issue of Classic Rock Magazine (Issue 161 – August 2011) OUT NOW. We have reproduced the article text for your viewing below but for all the nice photos plus a rough guide (tree map) to the Canterbury scene please purchase your own physical copy. In a sleepy corner of Kent in the late 60s and early 70s a peculiarly English very individual kind of rock music was taking shape that would forge some of the great bands of British prog. Welcome to the Canterbury scene. The hotchpotch of clued-up teens curious locals and pissed squaddies crammed into the smoky downstairs bar of the Bear And Key pub on Whitstable High Street on this Friday evening are blissfully unaware that the unceremonious event they’re about to witness will be prove to be a pivotal one in English rock history. It’s January 15 1965 and on the pub’s tiny stage the six young men from nearby Canterbury who make up the band called The Wilde Flowers are preparing to make their first public performance. Striking blond-haired vocalist Kevin Ayers guitarists Richard Sinclair and Brian Hopper the latter’s bassist brother Hugh keyboard player Mike Ratledge and drummer Robert Wyatt may be young but they possess both a quiet confidence and a fierce musical intellect. Taking the stage at 9pm dressed in brightly coloured silk shirts – pink turquoise yellow red blue and olive all hand-made by the Hoppers’ mum – their flamboyant mix of blues and rock’n’roll covers together with originals such as Ayers’ She’s Gone soon win over the disparate audience. Little did The Wilde Flowers know as they toasted their success with Coca-Cola on the short trip back to Canterbury that they had started out on a path which would put this sleepy corner of Kent on the rock map turning convention on its head in the process. British rock is essentially the sound of the city. From Merseybeat’s Northern reinvention of rhythm and blues to the Midlands’s molten contribution to heavy rock to the spiky belligerence of punk-era London it has largely derived its creative energy from the streets. But in Canterbury in the late 60s and early 70s a loosely aligned group of like-minded musicians – among them Caravan Soft Machine Kevin Ayers Gong and Hatfield And The North – communed a more meditative tradition. Inspired as much by jazz folk Anglican church hymns and modern classical music as by rock’n’roll this was a scene where the head ruled the heart musicianship was prized over blind enthusiasm and the object wasn’t commercial success but the thrill of infinite possibility. Viewed through the rose-tinted spectacles of history the Canterbury scene possesses a curious dream-like aura: a stoned shire of winding cobblestone streets and patchouli-scented head shops where zonked-out hippies on a diet of dope and mung beans created 18-minute song suites with titles like The Dabsong Conshirtoe (Caravan) and shorter though no less out-there songs such as Lobster In Cleavage Probe (Hatfield And The North). The thing that bound it all together was Canterbury itself. The cradle of English Christianity and a shrine for religious pilgrims for nearly a millennium Canterbury echoes with the spirits of Geoffrey Chaucer Thomas Beckett and Christopher Marlowe. Even today Kate Middleton lookalikes politely tout boat trips from Kings Bridge (built in 1134) to Greyfriars a 13th-century Franciscan chapel that lies a gentle punt down the river Stour. It’s easy to forget that London is just 60 miles away up the A2. The vibes may have been bucolic but had the Noise Abatement Society been active in the autumn of 1960 they would have undoubtedly been regular visitors to Wellington House. A rambling Georgian residence in Lydden 10 miles outside of Canterbury it was the home of BBC journalist Honor Wyatt her psychologist husband George Ellidge and their 15-year-old son Robert. A gifted pianist and painter the jazz-loving teenager was a budding bohemian with a rebellious streak – he was once caned for signing himself in as ‘Jesus Christ’ on a school trip to Canterbury Cathedral. The soundtrack of jazz and contemporary classical music that rang through Wellington House was ratcheted up several notches with the arrival of a lodger: a 21-year-old Australian beatnik named Daevid Allen. A long-haired beanpole with a suitcase full of 500 rare jazz albums Allen took delight in shocking the deeply conservative locals by walking through the town centre with his ‘pet’ – a can of dog food on a long piece of string. Wyatt and Allen immediately hit it off. House throbbed nightly with an atonal cacophony of artistic endeavour. The only thing they lacked was a decent guitarist. The solution came in the shape of Richard Sinclair an art-school friend of Hugh Hopper with an angelic singing voice a dry sense of humour and a musical pedigree that ran in the family (his father and grandfather were local musicians). Sinclair was soon enrolled on a crash course in the alternative lifestyle. That didn’t stop them christening themselves The Wilde Flowers (“Kevin added the ‘e’ in tribute to Oscar Wilde ” Wyatt says with a grin) and booking their first gig a few miles away at the Bear And Key in Whitstable. Julian Frederick Gordon Hastings – Pye to his friends – was a pupil at Pilgtim’s Boarding School in Lydden when he first became aware of the “strange music” emanating from Wellington House. A lanky ginger-haired teenager Hastings was the son of a banker and an Indian-born mother whose own father had been a Police Commissioner in India during the days of the Raj. His elder brother Jimmy was a respected saxophonist who had played with Brit jazz linchpin Humphrey Lyttelton’s band. Pye was also a friend of Kevin Ayers and was swiftly brought into The Wilde Flowers’ circle. A spectator at the band’s first gig he made the transition from fan to member when he stepped in to help out on guitar at a Battle Of The Bands contest in Margate in May 1965. To everyone’s surprise the band came out joint winners. If Hastings saw The Wilde Flowers as the start of a life in music for some of his new bandmates it was the springboard for a journey into the unknown. Frustrated by Canterbury’s inherent conservatism and enticed by Allen Wyatt and Ayers would embark on Kerouac-inspired trips to Paris Morocco and Ibiza while other members would come and go leaving Hastings to lead an ever-changing line-up of The Wilde Flowers. By the summer of 1966 The Wilde Flowers had split into two distinct albeit friendly camps. Inspired by a three-day acid trip in the Balearics Wyatt Allen and Ayers had formulated plans for the first avant-garde pop group which would be christened The Soft Machine (a name inspired by keyboard player Mike Ratledge’s interest in author William Burroughs). For Hastings the choice was stark: continue to play a mix of covers and originals in local pubs or form his own band with remaining Wilde Flowers Dave and Richard Sinclair and drummer Richard Coughlan. He opted for the latter. With the members of the nascent Canterbury scene literally doubled overnight the first half of 1967 saw the two new bands taking very different paths. On the back of a demo sent to Jimi Hendrix’s manager The Soft Machine relocated to London and promptly took the capital’s underground scene by storm thanks to a radical approach to live performance. “The music was played incredibly loud with lots of raucous fuzz organ and brainsearing fuzz bass through 100-watt Marshall stacks ” recalled bassist Hugh Hopper of those early gigs. By contrast the newly formed Caravan spent the Summer Of Love in less psychedelic fashion helping to build the Sevenoaks bypass in Kent. Moving into a shared house in Whitstable in January 1968 Caravan set about fine-tuning their sound. Where The Soft Machine bludgeoned their audience into submission Caravan opted for a gentler more jazzy approach with Dave Sinclair’s Hammond organ their not -so-secret weapon. Ironically despite its location the house in Whitstable would become the first hub of the emerging Canterbury scene. Attaching mattresses to window frames and pinning fibreglass to the walls Caravan turned it into their own rehearsal studio-corne-sonic laboratory. Things were tight: they played on equipment Soft Machine had lent to them while on tour in the US with Jimi Hendrix and lived on a diet of Marmite and Weetabix; creative fuel was supplied by repeated listens to Hendrix’s Electric Ladyland The Rolling Stones’ Their Satanic Majesties Request and John Mayall’s Blues Breakers and a big stash of dope. Money wasn’t Caravan’s only problem. The band were forced to move out of their shared house after complaints about the noise. They decided to camp outside the local church hall in nearby Graveney. When it got too cold they simply pitched their tents inside taking them down every Wednesday night for the vicar’s weekly youth club. With no fixed abode it’s little wonder that Caravan’s début Single A place Of My Own came with a tangible sense of pathos. A superb slice of psychedelic whimsy it showcased Hastings’s ability to harness the choral tradition of Canterbury to the spirit of the age. With Soft Machine’s fondness for elaborate time signatures and two-note Sufi-inspired drones not playing well in the provinces Caravan became Canterbury’s de facto band. Their self-titled debut album released in October 1968 pitched its woozy distinctly English psychedelia on a ley line somewhere between the Garden Of Eden and outer space while epic 14-minute closer For Richard – the climax to the band’s shows to this day – highlighted their musical skills and their vaulting ambition. With radio support from John Peel Caravan seemed to be on the verge of mainstream success. But then disaster struck when their label Verve closed down their UK operation without warning leaving Caravan homeless once again. The band had no choice but to hit the road. In October 1969 they played a triumphant show at Belgium’s Actuel Festival alongside Yes Genesis and Soft Machine. But at a gig at London’s Marquee club Hastings was almost electrocuted by some dodgywiring. The resultant press coverage in the Daily Mirror was scant consolation. By 1970 the Canterbury scene had broadened out to include several more like-minded bands including Gong (formed by Daevid Allen after leaving The Soft Machine in 1967) Spirogyra Dave Stewart’s Egg and Henry Cow. By September 1970 Caravan had signed to Decca’s psychedelic offshoot Deram and released their second album If I Could Do It Again I’d Do It All Over You. The suggestive title suggested there was a schoolboy humour behind the wide-eyed star-gazing. Had it come out 18 months earlier the album would have effortlessly bridged the gap between psychedelia and prog rock. But released in the same month as Black Sabbath’s Paranoid the whimsical cadences of And I Wish I Were Stoned were ill-suited to the proto-metal zeitgeist. While the title track earned them a surprise Top Of The Pops appearance the album itself failed to chart. At their new shared house St Elmo’s overlooking Canterbury golf course the band mused on their lack of progress with their friends in Soft Machine and a now solo Kevin Ayers. In this most progressive of scenes petty rivalries were considered pointless. Instead it was literally tea and sympathy all round. 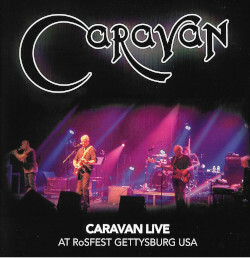 However marginal their presence on the pop scene the influence of Caravan – and by extension Canterbury – was spreading. At a communal house in St Raduginds St close to the Cathedral a hotbed of activity had sprung up around an informal network of musicians and art students. Among them was Essex-born Steve Hillage a 19-year-old student at Kent university and a supremely talented guitarist who would later go on to play with Gong and Khan and subsequently forge successful solo and producer (Simple Minds It Bites Robyn Hitchcock) careers. 22-minute seven-part opus Nine Feet Underground which featured keyboard mastery to rival prog rock rivals Keith Emerson and Rick Wakeman. Despite high expectations from all involved the album again failed to make any impression outside of fans of the burgeoning Canterbury scene. For Dave Sinclair it was the final straw. Frustrated by the band’s parlous fiscal state and lack of musical progression he quit in August 1971. As far back as The Wilde Flowers Canterbury’s musicians had a fluid approach to band membership and by 1971 a total of 12 people had been members of Soft Machine at various times. At the end of that year Robert Wyatt left the band due to internal tensions and a heavy touring schedule. He had already released a solo album the previous year. His next project was Matching Mole a collaboration with fellow Canterbury leading light Dave Sinclair. Back in the Caravan camp Pye Hastings had brought in keyboard player Steve Miller to take Dave’s place. But tensions were growing between Hastings and Richard Sinclair evident on the band’s next album 1972’s jazz-orientated Waterloo Lilly. When Richard left to join Delivery later to mutate into Hatfield And The North – in April 1973 it was no surprise. With two key members now gone Caravan were in serious danger of grinding to a halt. But an unlikely upturn in their fortunes came when Hastings chanced upon 22-year-old Geoff Richardson then living at the communal house on St Radigunds Street. A multi-instrumentalist with the same leftfield sense of humour as Hastings he was the ideal person to fill the musical void left by the departure of the two Sinclairs. Before he knew it Richardson was boarding a plane with the rest of Caravan for an Australian tour with Slade Status Quo and Lindisfarne. While wanton excess was never Caravan’s thing (“we were boozing of course but we were nice middle-class boys” says Richardson) playing in front of audiences of25 000 screaming Slade fans instilled a toughness in their 1973 album For Girls Who Grow Plump In The Night. It also saw the surprise return of Dave Sinclair. Short of cash having quit both Matching Mole and Hatfield And the North he returned to the band on a session basis. With Hastings’s pervy lyricism reaching new Max Miller-ish peaks (notably on The Dog The Dog He’s At It Again) … Plump … was the sound of a revved-up Caravan their finely tuned musical engine apparent in the 10-minute multi-part finale L’Auberge Du Sanglier/A Hunting We Shall Go. But Hastings’s schoolboy humour worked against him this time: the punning title and sleeve design featuring a slumbering girl (Hastings had originally wanted a gatefold image of a naked heavily pregnant woman) caused the album’s release to be delayed after complaints about sexism from Boots and Woolworth. Still the response to the new album together with the acclaim surrounding an orchestral concert at London’s Drury Lane Theatre brought them to the attention of Miles Copeland the fast-talking manager of Wishbone Ash and Curved Air. Crucially he had a reputation for breaking bands in the US. Copeland’s first move was to send the band on a 50-date coast-to-coast tour of the US in September 1974 supporting bands including Fleetwood Mac and Fairport Convention. With the wind in their sails expectations for the band’s next album were high with characteristically extravagant 18-minute song-suite The Dabsong Conshirtoe as the piece de resistance. However plans to call the record Toys In The Attic had to be abandoned at the last minute when the title was nabbed by Aerosmith. Hastings’s substitute? Cunning Stunts. Thanks to a Spinal Tap-esque manufacturing mix-up the album actually charted in Belgium as Stunning Cunts. In late 1975 Miles Copeland woke up one morning with a burning conviction. The previous evening he had the seen the future of rock in sleazy dump of a pub in Deptford. The band were called Squeeze. Embracing the nascent punk scene at West End club the Roxy Copeland realised that popular music was about to experience an upheaval not seen since Elvis’s appearance on the Ed Sullivan Show in 1956. Despite being dumped by their manager the penny didn’t drop immediately for Caravan. Punk? Copeland had clearly lost his marbles. In their minds the record-buying public would clearly prefer the good-humoured virtuosity of their new album Blind Dog At St Dunstans. Caravan soon realised they were wrong. By the summer of 1977 they and their Canterbury peers – among them Henry Cow and Camel – were as fashionable as bubonic plague. In the eyes of diehard Canterbury scene fans music was entering its version of the Dark Ages. By the mid-80s the Canterbury scene had only one very vocal public fan: Neil Wheedon Watkins Pye a clinically depressed vegetarian pacifist with the catchphrase ‘Heavy man’ and one of the main characters in anarchic BBC sitcom The Young Ones. Having reunited for a one-off TV special in 1990 the four original members of Caravan are now scattered around the world: Dave Sinclair lives in Tokyo Hastings in Scotland and Richard Sinclair in Italy. Drummer Richard Coughlan has suffered a series of strokes but remains landlord of the Cricketers pub in Canterbury High Street where he regularly fields requests from fans hoping he’ll sign their well-worn vinyl copies of If I Could Do It Again. Following a triumphant gig by Caravan at the Isle of Wight festival in 2005 Pye Hastings continues to tour with the band. The current lineup – also featuring Geoffrey Richardson and Richard Coughlan – are playing a series of gigs to mark the 40th anniversary of In The Land Of Grey And Pink (a special Deluxe Edition has just been released) including a slot at Classic Rock’s High Voltage festival on July 23. Daevid Allen will be touring this year with both his acoustic outfit Magick Brothas and psych-punk band University Of Errors Kevin Ayers remains suitably louche in the South of France while Richard Sinclair plays regularly from his base in Italy still amazed by the devotion of fans to music created more than 40 years ago. A new generation of bands meanwhile led by local heroes Syd Arthur (who include Raven Bush nephew of Kate) continue to spread the Canterbury gospel. Arguably most iconic of all is Robert Wyatt now a fixture on the more esoteric fringes of British music. His last album 2010’s For The Ghosts Within was released to universal acclaim even if he dismisses the idea of the ‘Canterbury scene’ as a media creation. As Neil Wheedon Watkins Pye might say: heavy man. Caravan play the High Voltage festival on July 23. This entry was posted in News and tagged 2011, Classic Rock Magazine on July 20, 2011 by caravan.